Thanks for the comment; looking forward to sitting down and trying your games as well. If I ever get to rewrite this as I wanted, pen and paper would be harder to use. Let's hope for all our sakes I don't get my way. }:) (To be honest, it would probably still be just as easy...) That said, a probably overlooked feature (my fault) is that you can 'examine floor' - that should tell you whether you've been there before and approximately how much. Also, love the fact you had to check my code to see if I was just trolling everyone! Seeing that made my day! 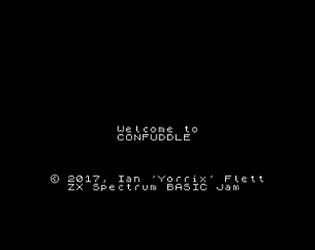 XD Thanks for the compliment on its structure; it's the first proper thing I've coded in Spectrum Basic for myself. Hi Jupi; thanks for the comment and letting me know about the video. Apologies for the late reply, but I've finally sat down and watched through both - you did a great job. I do hope you enjoyed the game. A little introduction/explanation screen, noting the 'help' command. Implement 'look' not just 'examine'. From seeing you play someone else's entry, an 'exits' command. Interesting! I've heard of a few text adventures with relative as opposed to absolute movement, but hadn't played one until now. Is there anything in the maze apart from dead ends? Thanks for your comment; so sorry it took so long to respond, but the last couple of weeks have been very busy. Regarding your question, not much. There is an escape hatch, which is your objective, though it only leads to another, slightly larger, maze (which starts as 5×5 but originally planned as 16×16!). I had wanted to add a key or coloured levers to unlock the hatch, but I ran out of time; much as there was a day added, I needed to focus on other things, unfortunately. Clearly, the movement scheme was intended to disorient (and took more programming than an NSEW scheme than might be apparent). Though now you mention it, I think I recall playing a game before that might have used an FBLR scheme. Looking forward to getting some time to play your games. This whole jam was a fun learning experience.